Your order ships same day if ordered before 2 pm EST Monday-Friday to arrive anywhere in the Contiguous United States within two to seven business days of our receiving your order. This item may be shipped to Canada, Alaska, Puerto Rico and Hawaii and arrives within eight to fourteen days. These multipurpose rustic pails come in a variety of 20 colors and styles, from vintage metal with a chalkboard to bright yellow. They can be used as a beautiful gift basket and even fit a bottle of wine. Line a variety of colors up on a windowsill and fill them with coordinating flowers for a creative decoration idea, or choose a few simple colors to put in your living room to collect and organize clutter. They are great for parties, showers, events, homes, and gardens. 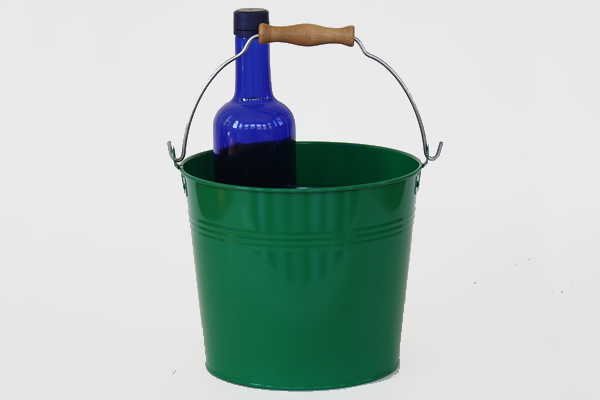 We offer a smaller bucket in 7 styles and colors. You might also like these 5 quart buckets with lids, 10 quart metal pails, and 4 gallon large metal buckets in 16 solid colors. Note: These buckets are not guaranteed to be watertight. As such, an optional plastic liner can be purchased. Arrived the same week! Plenty of time to get them ready for our wedding!